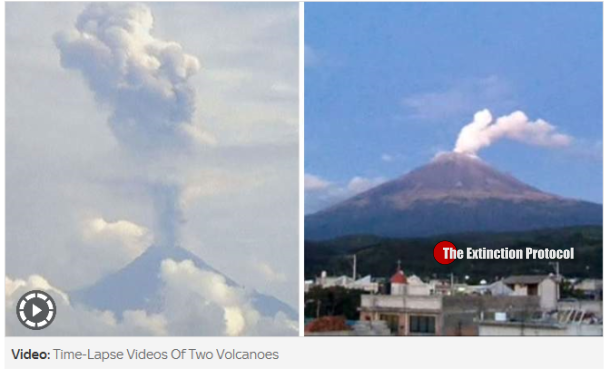 September 2015 – MEXICO – Colima Volcano, located in southwest Mexico, is spewing fresh smoke and ash in a series of small eruptions, according to reports Saturday. And, about 310 miles away, another volcano, Popocatepetl, has also erupted. The Colima volcano has been rumbling since July 10, when its last major eruption occurred. Also known as the Fire Volcano, Colima shot ash over 2,000 meters into the air and cloaked local villages with dust, RT.com reported. Local authorities are monitoring the volcano’s activity and have reportedly put an emergency plan into action. This entry was posted in Civilizations unraveling, Earth Changes, Earth Watch, Earthquake Omens?, Environmental Threat, Health guideliness issued, High-risk potential hazard zone, Potential Earthchange hotspot, Prophecies referenced, Seismic tremors, Signs of Magnetic Field weakening, Tectonic plate movement, Time - Event Acceleration, Volcanic Ash, Volcanic Eruption, Volcanic gas emissions, Volcano unrest, Volcano Watch. Bookmark the permalink.